The overall strength of the Canadian Dollar put bearish pressure on the USD/CAD exchange rate on Wednesday, thus sending the pair's to losses for the second consecutive trading session. This decline was stopped at the bottom border of an ascending pattern. It looks like the Greenback might be reluctant to push further south within this session. However, given that the SMAs is located above the price movement, the descending channel might prevail today. 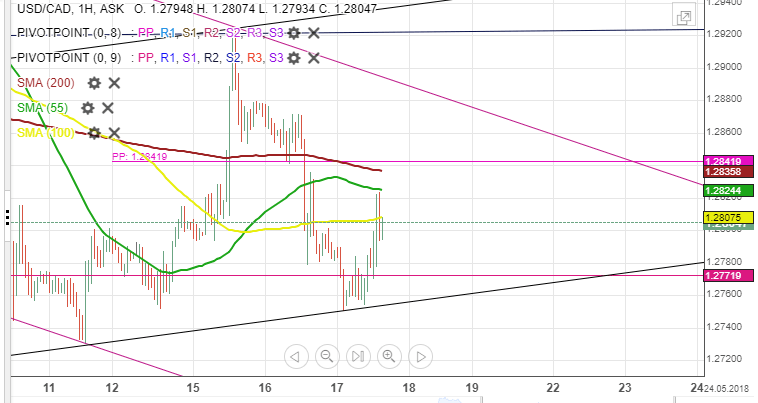 The nearest resistance level that could hinder the currency pair from gaining more points is either the 100– hour simple moving average or the 200– hour SMA located at 1.2805/1.2838.